Listening to Craig's music is like a slow deep passionate kiss on a cold winter night that pulls in so far that you seem lost and isolated from the world but totally at ease and satisfied! I can't ignore the fact that Craig at one time was the voice of SHUDDER TO THINK which is an amazing band but you have to listen to this disc with all that thrown out the window! This can not in my opinion compare to the SHUDDER TO THINK era. Don't get me wrong I absolutely love Shudder but this is a whole new experience... something better in my opinion! The first track KINGDOM let me know I was in for something different instantly... A perfect guitar sound and mix with the numbing bassline and Craig's heaven of a voice is truely beautiful. Craig's lyrics and arrangements are ungodly. I'm beginning to think this is truely the worlds greatest song writer... The songs almost have a COUNTRY twang to them which I love but still that warm comfortable Pop rock essence. "God, Thanks For Looking Down, But I'm Old Enough Been Told Enough Too!" the second track NIGHT IS OVER mixes that clean electric guitar with a throbbing drum beat which gives the song one helluva backbone! 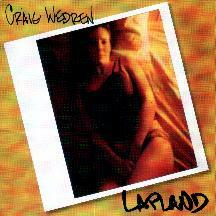 Scattered throughout the album there are female backing vocals which compliment Craig's violin of a voice perfectly. This song brings in a little more heaviness... reminds me of some of the powerful ballads from the 80s such as DRIVE by THE CARS! This song is amazing.. I can't say enough about Craig's voice.. it's a powerhouse hidden behind a shy sensitive facade! This song should definately be a radio hit! The next song WANNA DRIVE? proves that Craig doesn't even need words to outsing even the best DIVA! ALONE IN LOVE is a beautiful deep and dark desperate cry for love... perfection! FIFTEEN MINUTES LATE is the next track. I have to say Craig has a control over his guitar that most do not. Reinventing traditional ways to play and things that just shouldn't work he makes sound like honey dripping so seductive and slow. RAIN DIAMONDS is track 7.. one thing I love about this man is his amazing way to phraze words and lines... Even if it shouldn't fit it works so well when he sings it. Speaking of THE CARS the song BORN CURIOS has a great Palm Muted Cars style guitar... and again the vocals.. man.. I could write a whole review by saying CRAIG IS THE BEST SINGER IN THE WORLD END OF STORY! STUCK! I saw this song performed on some Television show, he had a stage full of small children holding up the signs Sun-Sat at the right time while he sang.. and this song is such a warm fuzzy blanket.. makes you want to cuddle up with it on a cold rainy evening with someone you really admire!... paints a visual of a beautiful woman wearing one of my big t-shirts and boxes walking around the house barefoot with a cup of hot chocolate. a little different than the rest.. maybe a bit more experimental, compared to the rest of the album but if you know much about Craig you expect this. One of the heaviest tracks on the CD (this cd is mostly calm mellow music easy to slow dance to) is LOVE AMONG RUINS. has a great muffled distortion feeling laced with muscle relaxers and happiness! and finally my absolute favorite track on the whole disc ONE MANS HEART. I can totally put this song on repeat and listen to it for hours.. beautifully romantic but equally depressing. You don't know wether to cry or smile... or even better smile as you softly wipe the tear off the cheek of someone you love.. Craig has a way of making you fall in love with him and his music in a way that shouldn't be legal. the last track LAUGHING LIDDY is pretty much a beautiful guitar outro.. with some effects.. just listen you'll like it. I tried to do this review without mentioned SHUDDER TO THINK other than explaining where he came from.. I'll have to admit you will hear a lot of similarities... but listen to it as if you had never heard his previous band.. what were they called anyway? I think musicians can spend a lifetime and only DREAM of an album so perfect!